The Georgia Bulldogs are set to play their third consecutive home game Saturday as they host the Vanderbilt Commodores with revenge on their mind. Last season, the Bulldogs limped into Vanderbilt Stadium without their two star running backs, Todd Gurley and Keith Marshall, and many of their top receivers. By the end of that game they experienced more injuries, two bogus targeting calls and their second conference defeat of the season. Vanderbilt went on to win nine games, while the 2013 UGA season will be remembered more for the injury list than victories in the win column. Will the Bulldogs repay the nightmare in Nashville or will the Commodores shock the world and beat Georgia in Athens? After winning 18 games in two seasons, the Commodores were a program on the rise. However, after the departure of James Franklin to Penn State, Vandy’s stock has dropped quicker than Enron’s. As bad as Vandy has been this season, they did give South Carolina a major scare two weeks ago. The offense is beyond anemic, but the Commodores have been able to find other ways to score. Strangely enough, defensive back Darrius Sims has led Vandy in scoring the last two games. Against South Carolina, Sims returned not one but two Gamecock kickoffs for touchdowns. Last week against Kentucky, he had a 13-yard interception return for a touchdown. Perhaps it will not be Sims, but the Commodores will have to continue to find ways to score points with starting quarterback Patton Robinette out once again. The Bulldogs not only need to win this game, they need to do it in impressive fashion. They control their destiny once again in the Eastern division, but have no room for error. Fortunately for Georgia fans, the Bulldogs have the top player in all of college football in Todd Gurley. Georgia will also have burners Malcolm Mitchell and Justin Scott Wesley in the lineup for the first time this season. This should give the Bulldogs the speed they need on the outside and allow Michael Bennett and Chris Conley to play their normal roles as well. The Bulldogs also have a favorable matchup when on defense. How bad is Vanderbilt’s offense? Only five of its 11 touchdowns have come from the offense. Georgia’s special teams will decide how fast the Bulldogs put the Commodores away. Vandy has already scored four touchdowns on special teams this season. It was special teams blunders that cost Georgia last season. A fumbled punt by Damian Swann, punter Collin Barber being forced to fall on a high snap at his own 13 and a 3-yard TD on a fake field goal was the difference in the game. The Bulldogs need to play much better to avoid this being a close game. I think the Georgia Bulldogs will come out and run the ball early, but pass more than expected. With Keith Marshall and Sony Michel banged up, I think Mark Richt will pass the ball just so his two remaining backs don’t take too many hits. Usually I would not agree with this method. In fact, I think a 1980 type playbook fits this team, when healthy, perfectly. 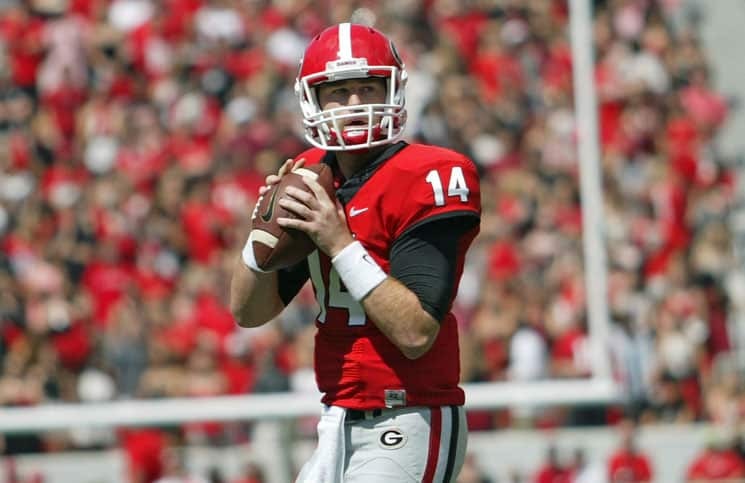 However, this is a game the Bulldogs will win and Hutson Mason needs his confidence back. I watched film of his first two starts and noticed a dramatic difference in his throwing motion. He is hesitant on every pass and that is why the ball is coming out so slow and short. Don’t get me wrong, he will never be mistaken for Matthew Stafford. However, his arm strength is better than what he has been showing the past few games. If he can find a rhythm and get his confidence back, the Bulldogs are national championship contenders once again. Dr. SEC is a contributor to SicEmDawgs.com. Follow him on Twitter and Facebook and at DrSEC.org.